The new symbol, developed by human factor experts, graphic artists, and radiation protection experts, was tested by the Gallup Institute on a total of 1 650 individuals in Brazil, Mexico, Morocco, Kenya, Saudi Arabia, China, India, Thailand, Poland, Ukraine and the United States. The symbol was tested with different population groups - mixed ages, varying educational backgrounds, male and female - to ensure that its message of "danger - stay away" was crystal clear and understood by all. Crystal clear? I don't think so, but it's pretty good given the space limitation of a triangular sign. Some people will think they're being told to run to the right. Also, why is the background red? Isn't the standard symbol black on yellow? Just off the top of my head, I think a better sign would have been rectangular and had three panels stacked vertically: First panel, Mr. Stick Figure sees the trefoil symbol (dotted line with arrow from head to symbol). Second panel, trefoil symbol radiating with wavy lines at the skull and crossbones. Third panel, Mr. Stick Figure running away from trefoil symbol. 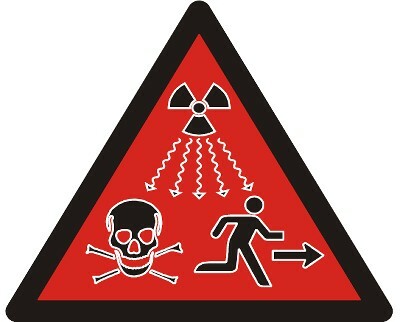 The symbol is intended for IAEA Category 1, 2 and 3 sources defined as dangerous sources capable of death or serious injury, including food irradiators, teletherapy machines for cancer treatment and industrial radiography units. The symbol is to be placed on the device housing the source, as a warning not to dismantle the device or to get any closer. It will not be visible under normal use, only if someone attempts to disassemble the device. Huh? Is big agribusiness in the habit of simply tossing their food irradiators out in the dumpster where some curious kids are going to start taking it apart? I mean, shouldn't anyone disassembling something like that already know that it's radioactive? Cynical answer: A skull and crossbones means the customer won't try to repair his machine himself, but will hire your expensive repair technician. Less cynical answer: Machines wear out. The person trying to fix it or disassemble it for scrap doesn't necessarily know what it is. Huh? Is big agribusiness in the habit of simply tossing their food irradiators out in the dumpster where some curious kids are going to start taking it apart?Short answer: Yes. Particularly in the 3rd World. And when they get thrown away, as Mithras said, they get junked or otherwise scavenged for scrap metal, usually by illiterate people. If a fan blows on you, it's death to run away.